Vegetable gardeners are of different minds about growing spring cabbage. There are those who love everything about this crop: the joy of watching seedlings that look like any other brassica gradually wrap their leaves around each other to form heads; the tidy appearance in the garden; the crisp crunch of cole slaw. And there are those who say it takes up too much space and is cheap to buy, so why would you bother? I’d say if your garden is small, it’s not worth growing for those reasons. But if you have the space, give it a try! Unless you have a large family, though, or a lot of cabbage recipes to go through, make sure you don’t overdo the planting, and grow a few different varieties so you won’t be harvesting all at once. When you’re selecting varieties, make sure you take a look at the “days to maturity” listed in the catalog or on the seed packet. This will let you know whether you’ll be harvesting your cabbage in a timely fashion (late May to mid-June) or whether you’ll be worrying that it might bolt in the summer heat before the heads form. Some cabbage varieties list days to maturity of as much as 90 days; these are meant for cooler climates than ours, or for fall harvest. In our Maryland heat, you don’t want to go above 70 days for spring cabbage, and the shorter the better. Remember that the number listed for days to maturity is an estimate dependent on weather conditions, and that it refers to days from transplant, not from seeding. Cabbage will likely be growing indoors for one to two months before being transplanted outdoors. If you don’t have a seed-starting setup indoors, be prepared to buy your transplants. This year in the Derwood Demo Garden we are growing Caraflex, Red Express, and Katarina cabbages. 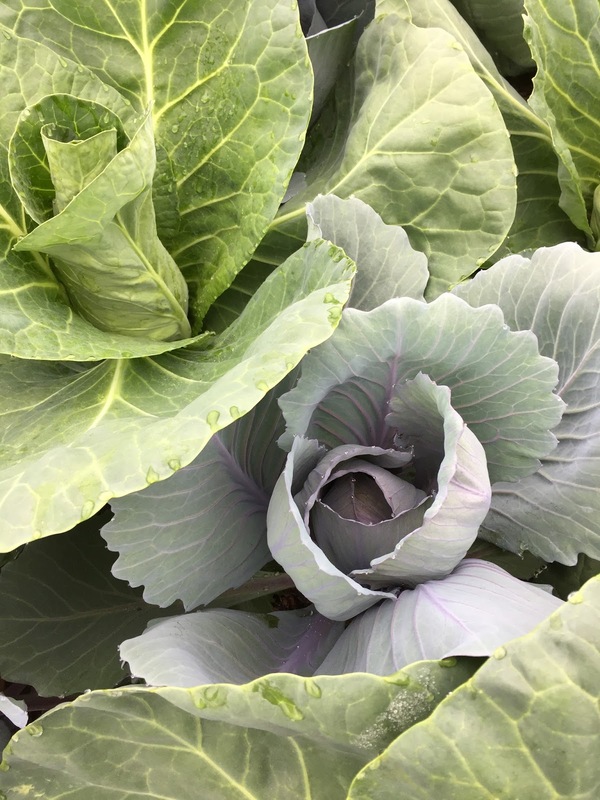 Caraflex is a green cabbage that grows into a pointed shape; we transplanted it on April 4 and harvested some on May 30 – that’s 56 days, beating the stated 68 days to maturity by a lot. But most of it won’t be ready to harvest until next week. Red Express, a small-headed red cabbage, is supposed to mature at 62 days, and should hit that target just about right. I neglected to take a photo of Katarina, but it’s a new small green variety with a 45-day maturity estimate, and we harvested it this week at 42 days from transplant (it went in two weeks later than the others). There are lots of other short-season varieties hitting the catalogs, so keep a look out for them. With erratic weather patterns increasing, short-season spring cabbages will be the way to go. Smaller heads (for smaller gardens and families) are also a new emphasis. All three varieties we grew are taking up less room than some old-fashioned cabbages, better for intensive planting. Although the outer leaves of Caraflex were about 18 inches wide and very impressive! Don’t forget that the outer leaves of cabbage are perfectly edible – just pretend they are collards.